Republicans and Democrats alike expressed outrage over President Barack Obama’s decision on Jan. 17 to commute the 35-year prison term of Chelsea Manning. Manning, the former Army intelligence specialist who turned over some 700,000 classified and sensitive diplomatic documents to WikiLeaks, will be released in May. Chelsea, formerly Bradley, Manning will be released in May. Manning’s “dishonor will last forever,” McCain said. Obama’s own defense secretary, Ash Carter, said he “did not support” reducing Manning’s sentence for leaking classified information about U.S. national security activities. 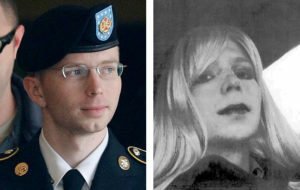 Prior to Jan. 17, Obama had defied appeals from advocacy groups, including Amnesty International, to release Manning, who originally was known as Bradley but has been undergoing a gender transformation since she was arrested. She was convicted of multiple counts under the Espionage Act, and given the 35-year term on Aug. 21, 2013. She is serving her term in an all-male prison. Sen. Tom Cotton, a member of the Armed Services Committee who as an Army officer served in both Iraq and Afghanistan, also slammed Obama’s move. “When I was leading soldiers in Afghanistan, Pvt. Manning was undermining us by leaking hundreds of thousands of classified documents to WikiLeaks,” Cotton said. Obama also pardoned retired Marine Gen. James Cartwright, the former vice-chairman of the Joint Chiefs of Staff who pleaded guilty to lying to federal investigators when he denied that he revealed to The New York Times the existence of a highly classified campaign to cripple Iran’s nuclear program with a computer worm. The Stuxnet virus crippled Iran’s nuclear equipment and was the first major use in history of a digital weapon. Obama also commuted the sentence of terrorist Oscar Lopez-Rivera, who fought for Puerto Rican independence through Fuerzas Armadas de Liberación Nacional, or FALN, a group that claimed it was behind more than 70 bombings in New York from 1974 to 1983.